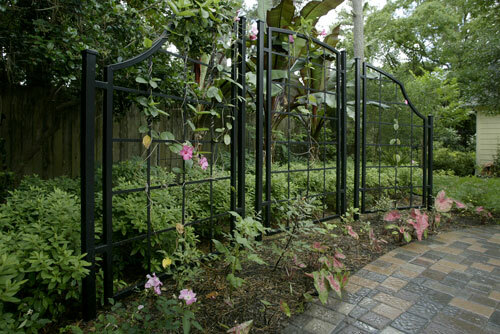 At face value, many might assume that an iron arbor would clash with vegetation and other natural features. In fact, the opposite can often be true. 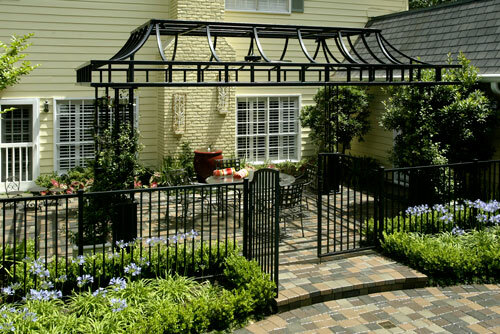 A wrought iron arbor can provide a very elegant compliment to gardens, walkways, patios, and swimming pools. 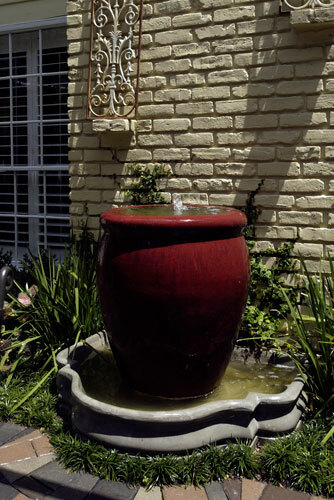 It can fulfill any number of ornamental and functional needs that add depth and dimension to the landscape, and it can add a touch of refinement, or even antiquity, to key areas throughout the property. 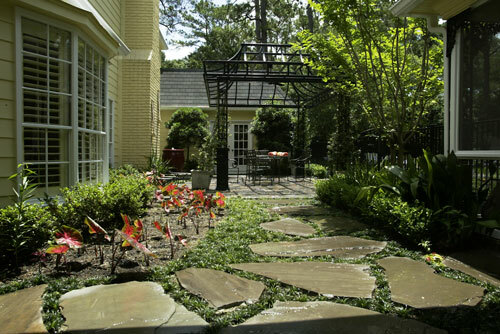 This was exactly the type of effect that a local Houston family by the name of Macalister was seeking when they called us to their home to install a new swimming pool, and iron arbor, and a new stone pathway. 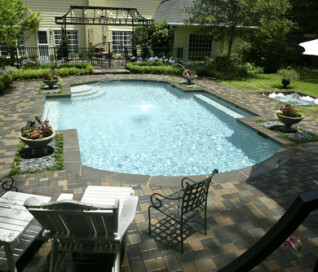 They had grown tired of an old, curvilinear pool that was surrounded by a brick and wooden deck. The curve pool had no relationship to the rest of the homes architecture, and the wood in the deck had become worn over the years. 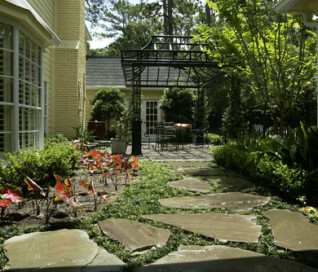 There were also three separate patios rather than a single, general seating area, which made it inconvenient for the Macalister’s to comfortably host a large party of guests. What they wanted now was a more expansive public area where everyone could sit together, and a swimming pool that looked softer and more inviting. We built them a new swimming pool that was straight on both sides, but was distinguished by rounded ends that extended a gentle invitation to enter the water. We surrounded it with a single paver patio made of interlocking concrete blocks that ran all the way up to the back door of the house. Large parties could now gather around the pool and all sit together. 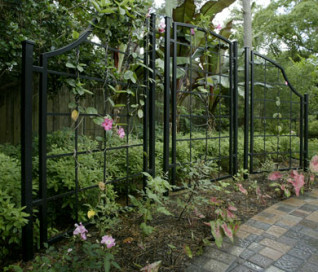 To prevent children from entering this area unsupervised, we erected a 48” iron fence with a 54” arched, locking gate. This was added partly for landscaping aesthetic, and partly to satisfy city safety codes that require pool locks to be constructed at this height. 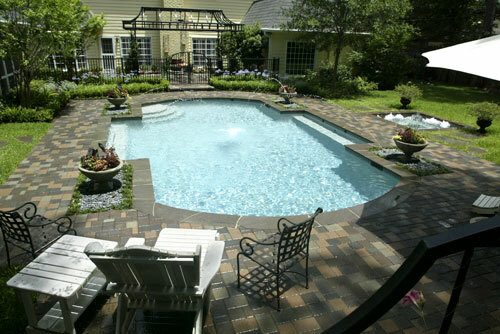 The addition of the fence had the effect of separating the portion of the patio nearest to the house from the larger area surrounding the pool. This smaller patio area in turn provided an ideal location to construct the arbor the Macalister’s had always dreamed of having built. They did not want a heavy wooden structure, but instead preferred an iron arbor that would ornament the landscape with an Old World touch, and more easily allow summer breezes to blow though its center. This arbor was the most unique element in our project, because even though it was very minimalist in form, it was optimized for comfort with a ceiling fan, and wired with lights that made it stand out after sunset. In order to better unify the iron arbor, fence, and gate with the natural landscape, we laid down flat stones between the driveway and the new structure; adding monkey grass between the stones to create the sense of a living walkway. At the far end of the pool, we expanded the green border of the property line into a lush garden, and further ornamented the area with an arching trellis that balanced the scene and complimented the arches of the gate and arbor. 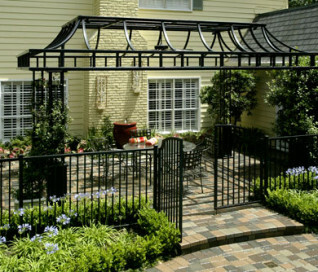 An iron arbor such as the one we built for the Macalister’s can be used in many similar applications to connote elegance, historicity, and a grounded sense of proportion. 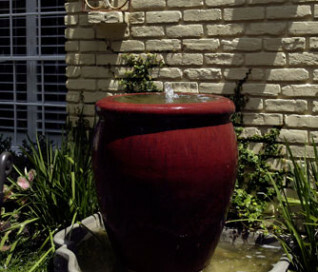 Iron combines strength with flexibility, and can be molded into a number of traditional and abstract forms that can contribute function, decoration, and proportion to virtually any outdoor area. 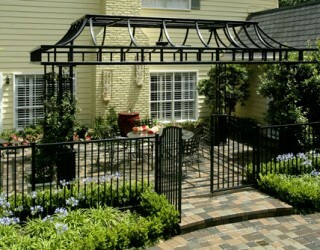 One more benefit that wrought iron arbors and fences offer is adaptability to almost any type or size of environment. We see them everywhere from corporate lawns to private suburban homes, and all the way up to large custom homes surrounded by vast acreages.